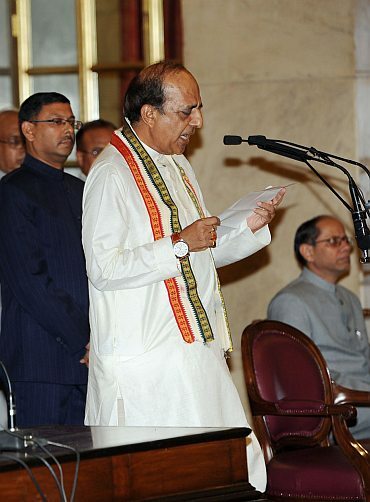 Sheela Bhatt traces the fascinating life journey of India's new Railway Minister Dinesh Trivedi. "God has been kind. Mother Nature is gracious." This is what Dinesh Trivedi, 61, India's new railway minister must have murmured after taking oath. Trivedi is a believer with a difference. If you ask him do you believe in God, his answer would be, "Yes I believe in nature. God is nature." By 'god's grace' Trivedi has been lucky. He studied in an elite boarding school in Shimla and Salon in Himachal Pradesh. He graduated from Kolkata's St Xavier's College and then went on to get an MBA from Austin, Texas in US. He earned awesome salaries, even by American standards, while working in Chicago in the mid-seventies. He is a trained pilot, a fine golfer, loves music and sur of Abida Parveen. He uses the latest and best gadgets to communicate. His website www.dineshtrivedi.com is swank and smart. (But it's overdone for an Indian neta!) However, don't make a mistake in judging him. He is as desi as any Indian minister can be. He wears a blue safire ring on his middle finger. Then, someone told him it can adversely affect him so he is countering its effect by wearing an emerald ring on his small finger and like many Indians, he wears coral too, to diminish mangal griha's effect. In short, Trivedi is a normal guy with normal Indian weaknesses but he is an extraordinary man of expression. He loves people. He loves giving speeches and gets huge satisfaction when he is able to communicate successfully. Nobody would deny that he has got the talent to communicate or how else can a Gujarati businessman impress upon and cajole Bengalis in Barrackpore to vote for him? Note that members of Muslim community in his constituency swear by his social work. Trivedi, now an old fixture in New Delhi's power elite club, had an interesting life before he plunged into politics and shifted from the Janata Dal party to the Congress to the Trinmool Congress. In the 1980s he was smitten by Rajiv Gandhi and later he put his life and times behind Mamta Banerji. Succeeding none other than his boss in the rail ministry makes him bit nervous. Without sounding hypocritical he expands his two hands in different directions and says, "I am here and Mamta is up there. There is no comparison. She is a giant killer." The experiences of his past, when Trivedi tried to shape his optimum identity have made him richer to take him to this pleasant climax of his career. To head the Indian Railways means that he will be leading around 1.6 million employees. Trivedi is fully aware of its potential. He says, "The railways' are as disciplined as the Indian Army. I know, if I work hard I can add 2 percent to India's GDP!" What he doesn't say is that he will succeed only if Mamta Banerji gives him space to function beyond projects of West Bengal. If you read his life sketch it seems Trivedi has seen it all, done it all before entering the rail ministry. Since he was ten years old, Trivedi wanted to join the Indian Air force. He wanted to fly. His father Hiralal was a migrant from Karachi. All Trivedi's siblings were born in Karachi before Independence. After 1947, his father and mother Urmila kept shifting from Patiala to Ropar to Bhatinda to New Delhi. After lots of struggle, they decided to settle in Kolkata. His father was an employee in Hindustan Construction Company that ensured that Dinesh Trivedi never saw tough financial times. However, he says with firm voice, "I always knew one thing. I never want to be a businessman all my life. Period. Anybody can do business but not all people can help the masses." After graduation, although, his father could have helped him, Trivedi took a loan of Rs 20,000 to study in America. He says, "I paid Rs 4,300 for the ticket. I think it was a good decision since it taught me how to be on your own feet." He says, "While working in America I understood the value of equality. Now, I give equal respect to (Reliance Industries chairman) Mukesh Ambani and my driver. Both are human so why differentiate?" Trivedi was always uncomfortable about getting too comfortable in life. When in 1974 he got a dream job in Detex Company of Chicago in the chairman's office, he worked hard for two years but then left for India. "I like a few things about America. But I never wanted a Green Card. When I told my boss I am leaving of India, he told me my job is not easily available even to Americans." Later in India, when he got job offers from Tata Consulting Services and Shaw Wallace he let it go thinking that it's too good a job and he might not leave to pursue a career in public service. "In TCS my life would have become too comfortable and successful. So I didn't join." However, after returning from US, he took a job with Lee and Muirhead to try out his luck. The company provided different kind of logistics. Dineshbhai learnt the tricks of the trade. In 1984, like most Gujaratis of his class do, he left the job and started his own company to manage air freight for various clients in Kolkata. Not only did money came, stability came, too. But he wasn't satisfied, so he started a consumer protection centre from his office. Still, he was not sure for many years what he exactly wanted. He once applied to the Pune Film Institute to take training to become an actor. But then he thought only the director's job is serious and not the actor's, so he didn't pursue it. He always loved mystique of saints and Sufism. He got hugely attracted to Swami Chinmayanand and has followed his teachings for many decades. He says, "Swami Chinmayanand has guided my spiritual path, always." Believe it or not, Trivedi once wanted to become a monk! He cut out an advertisement from the Ramkrishna Mission inviting youth to join. The advertisement had a famous picture of Swami Vivekananad with folded hands and head held high. Trivedi thought if he joins the mission he may be able to help more people. But his family pulled him away from such ideas. Swami Bhashyanand of Chicago also guided him to not take sanyas. Trivedi has many such stories to share. Three times in mid-seventies he had gone with his baggage to Kolkata airport to leave again for America. His relatives were irritated. Then his father told him he should not run away from India. "I was so fed up of corruption then. I thought I can't progress here. But, my father told me to learn to fight corruption, make your way." Trivedi took father's advice seriously. That changed his life. Trivedi filed many cases against the authorities. One was against the government-owned telecom company for not providing telephone service 30 days in a month. He asked how the government can take rent for a full month if phones are not working all the time? When one private company didn't clear the debris from the roads, he filed a petition in court. Trivedi came to the notice for the first time in New Delhi when he filed a petition in the Supreme Court to make public the Vohra Committee report on the criminal-politician nexus and he urged the court to give direction to the government take action. The petition became historic because the Right to Information Act and Lokpal bill were mentioned in judgment. It gave a legal push to the RTI movement. In New Delhi, due to his interest in flying he came in touch with former prime minister Rajiv Gandhi. Trivedi says by 1991 Rajiv had learnt his lessons and knew about his mistakes. He says, "Rajiv was jovial man. He had clear heart and he would have changed the destiny of India if he would have lived longer." Trivedi is quite sensitive about his image, as all politicians are. He dislikes strongly if he is called a 'fixer' of Trinmool Congress's Delhi affairs. He says, "You may call me a trouble-shooter. But, if I don't have the conviction of the party I can't grow." Trivedi is the founder member and first general secretary of the Trinamool. He insists, "I believe in what Mamtaji believes in. I may be wearing different style of clothes but our inner thinking is not different. Like her I think farmers are what make India. We have to listen to their woes." Within West Bengal, Trivedi enjoys a political existence that threatens nobody. His Gujarati wife Minal is a doctorate in genetics. Her family has been residing in Bengal since the last 170 years. His son Parth is doing aerospace engineering in Purdue University in America. Yesterday his son after an extensive search on the Internet said that he is the first Gujarati railway minister. But, Trivedi says, "I am Indian. I am very happy with whatever is my identity."